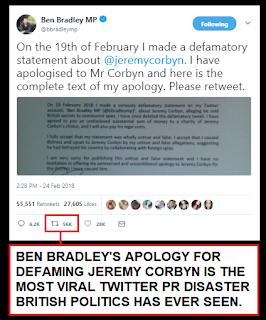 The Tory MP Ben Bradley isn't just a nasty piece of work who defames his political opponents, calls for the sterilisation of poor people, and joked with Iain Duncan Smith about castrating a journalist who dared to criticise him, he's also a remarkably dim bulb who couldn't spot a public relations own goal if it slapped him in the face. Fresh from creating the most viral political Twitter disaster British politics has ever seen with his apology for defaming Jeremy Corbyn, Ben Bradley must have thought that he'd scored a magnificent public relations goal by announcing the defection of two Ashfield councillors from Labour to the Tories. 'Oh good' he must have thought, 'a chance to bash Jeremy Corbyn by citing "Momentum" as the reason for the defections'. The problem of course is that these defections don't really do anything to make the Tories look good, but do an awful lot to reinforce the Labour left narrative that the Labour Party has been somewhat over-run by a bunch of self-serving right-wing neoliberals in recent decades, and that re-selection is a means of removing the worst of these "Red Tory" infiltrators from the party. If these defecting councillors have decided that they've got more in common with the pro-privatisation, pro-austerity, welfare-slashing, workers' rights trashing, NHS vandalising, disability discriminating, local government wrecking, blue-kip panderning, hard-right ultranationalist Tories than with their fellow Labour Party members ... then what the hell were they doing in the Labour Party in the first place? Aside from actively confirming the accusation that the Labour Party has been infiltrated by "Red Tories" and adding weight to the calls for re-selection of Labour MPs to ensure they actually represent the will of the party membership rather than their own right-wing agenda ... there's more. It turns out that one of the defectors has actually been democratically deselected as a Labour Party candidate by local people, and was being investigated by the party over allegations of racism! It tells us a lot about the Tories that they're so keen to make a fanfare of poaching a Labour councillor, but that they "forgot" to mention the fact their new guy ran away because he's under investigation for alleged racism. I'm a strong believer in due process, so it's absolutely right that Labour were investigating the issue internally before taking action, but now that Lee Anderson has damaged the Labour Party further by defecting to the Tory party, it seems like the racism allegations should be made public, because there's no conceivable justification for conducting an internal party investigation into the alleged racism of a guy who is now another party's politician. So in one failed PR stunt Ben Bradley has managed to clearly demonstrate the validity of the left-wing "red Tory" narrative about the problem of pro-austerity pro-privatisation neoliberals in the Labour Party, and also make the Tory party look so desperate that they're lapping up the Labour Party's disgusting unwanted dregs! 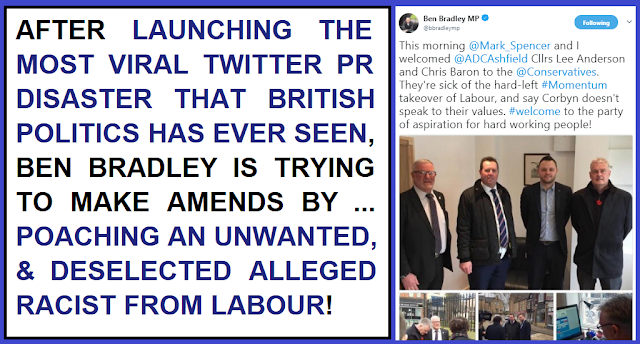 But then again, don't the unwanted backstabbing alleged racist Lee Anderson and the elitist sterilise the poor proven liar Ben Bradley just make a perfect couple?